Ask fellow campers about "Peach Beach Campark (Sunset Orchards)" and nearby attractions. We chose this private park over the State Park next door looking for a higher quality experience. Nope. For starters, you are packed in like sardines. The spots are some of the closest together I have ever seen. Yes, you can extend your slide-out, but it will literally be 2-3 feet from your neighbors picnic table. There is a row of partial hookup spots that back up to the river, but they're also packed in so tight that they block everyone else's view. The grass is dead and the soil is packed hard as a rock. The sites are uneven gravel and the roads through the park are two way and very narrow. Campfires? Nope. Never. You can use your propane fire, but there are not even fire rings (probably because of the dry grass). The wifi wasn't good enough to be called spotty - it was unusable. Someone mentioned that if you were near the bath house it worked better so maybe keep that in mind. Lots of hornets with no sign of any attempt to control them. I didn't use the bathroom except to look at them for this review. Clean enough, but one long room contained the sinks, stalls and showers. For the number of sites in the park, 82 I believe, it seemed like a bare minimum of facilities. The spots are long and I saw several class "A"s and toads so no trouble there. There was a lot of train noise, but I won't hold that against them, you should expect that in this area. Also, the staff was friendly and it's located close to highway 97 and I-84. Overall, I can't see why it's so popular. It was packed-even for a weekend. I would look elsewhere. We camped at Peach Beach Campark (Sunset Orchards) in a Travel Trailer. Maryhill Museum was a must-see and so was Stonehenge and the observatory (which is temporarily housed next to Stonehenge through summer of '19). The Maryhill winery was beautiful, if not a little stuffy, but it's a beautiful place with frequent live music. All of this within a 10 minute drive from the park. One could easily rate this park higher because of the views. Very easy access to I84. The road into the park needs repair. The trains run at all hours on both sides of the Columbia. There is an at grade crossing nearby in "downtown" Maryhill and some trains blow their horn. Road noise from the interstate is minimal at night. I could not receive any OTA channels. Satellite reception is very dependent on your site. Water pressure is low. We camped at Peach Beach Campark (Sunset Orchards) in a Travel Trailer. Years ago when I last stayed here, no reservations were taken, so I was surprised when there was only one site remaining when I arrived. Roads are gravel and sites are on gravel and grass. There are both pull through and back-in sites, and some have a view of the Columbia river. Most sites have at least partial shade, many have total shade. The park is dog friendly and is right next to the day area of Maryhill state park. Would stay again, but would consider making a reservation. We camped at Peach Beach Campark (Sunset Orchards) in a Motorhome. Visit the Maryhill art museum while you're in the area and drive out to the Stonehenge replica war memorial. Despite the fact this campground is older, it was very well maintained. The site was a back in and there was room for our toad. If we returned to the area, not sure if we would stay here or at a couple of parks closer to town. We camped at Peach Beach Campark (Sunset Orchards) in a Motorhome. 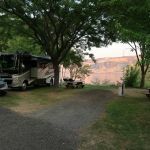 Stayed for one night..people who host the park are very kind..the phone and Web site were no help we took chance and drove here..con- no TV or cable...pro--nice campgrounds everything clean didn't see laundry..electric and water fine ..site level..trees for cover Columbia River is at edge of the property good spacing for bump outs..wifi worked fine..the park is behind orchards and trains run near by..we didn't hear them..looks like a lot of week-long renters...would stay here again We camped at Peach Beach Campark (Sunset Orchards) in a Motorhome. Beautiful wide grass sites right on the Columbia River. Easy access to interstate at Biggs Junction. We camped at Peach Beach Campark (Sunset Orchards) in a Travel Trailer. Visit the adjacent fruit stand/orchard. Best priced park in the area. Well kept. FHU's good quality. Pull throughs are side-curved, no sewer. Back in sites in the center of camp have sewer. Wifi dropped at times but mostly usable. Marginal but useable Verizon, T-Mobile did not work as well. They are a bit hard to get hold of sometimes, leave message. There are camp hosts. Your name will be posted on your site when you arrive. Lots of green area for rover. Access to beaches, and park next door to campground. Big with boaters and fishermen. There were a lot of dogs on on leash in the camp when we were here. Overall the camp was well maintained and quiet. Some sites are satellite friendly, but most it can be a close call. A carryout dish may do the job. There are two dump stations to use. No propane. No fires allowed here. Sites are gravel and level. There is noticeable train noise, (horns especially) did not bother us, but we did notice the horns. Back-ins are slanted and looked easy enough. Interior roads were no problem for our 36' motorhome. Would stay here again for short stays. We camped at Peach Beach Campark (Sunset Orchards) in a Motorhome. See Stonehenge made by Sam Hill, Great art museum with food and nice place to eat. Mary Hill Winery very good, outdoor seating dog friendly. Very nice park and friendly staff. Pull thru doesn't have sewer, others do. We camped at Peach Beach Campark (Sunset Orchards) in a Motorhome. 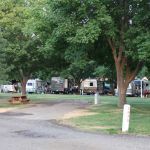 A pleasant green campground with small trees and riverfront views. Clean and comfortable. We would happily stay again. After seeing the neighboring state park was going to cost $53.00 for one night, I selected Peach Beach for our overnight stay in the Maryhill area. The only difficulty was in making a reservation. We called during the posted hours on their website, and had no luck reaching anyone. The voicemail box was full, so we could not leave a message. We pulled into the park around 4pm on a Thursday afternoon with no reservations, and took one of the few open sites remaining. It was a water and electric back-in site with a fairly level gravel drive. The site was moderately narrow, but we fit. 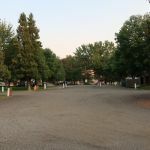 The campground is well-manicured, green, and filled with many small trees. A peach orchard just outside gives the campground its name. We enjoyed walking down near the river, and over to Maryhill State Park right next door. The bathrooms were clean and well maintained, but a bit out-dated looking. The dump station was clean and functional. We had a pleasant stay, and would happily visit again. We camped at Peach Beach Campark (Sunset Orchards) in a Travel Trailer. We enjoyed both the Maryhill Winery and the Maryhill Museum up the road. This park is located just East of Maryhill State Park. It was self check in, we never saw an attendant of any kind. We pick a spot right on the Columbia River. The place is immaculate, nothing out of place. The back in spaces o the river have only power and water, the pull throughs have sewer too at $5 more. There is a dump station. No fires of any kind are allowed. We camped at Peach Beach Campark (Sunset Orchards) in a Motorhome. Just up the hill is a full size replica of Stonehenge, worth the trip. This a great alternative to Mary Hill state park, even if the state park is not full. The rate reflects a site with out sewer hookup. Friendly campsite hosts, level sites, good Wi-Fi, picnic tables, and lots of nicely kept lawn made this a very nice overnight stay. The washrooms, while clean enough, are throwbacks to decades past, and long overdue for a remodel. Train noise may be an issue if you were staying for more than a night or two. We would overnight here again. We camped at Peach Beach Campark (Sunset Orchards) in a Motorhome. This is not a bad location but not somewhere we would want to stay for a long time. The trains run constantly. For 50amp service and pull through site there is no sewer hookup. The pull through sites are not easy in or out because they curve. Some of the back in sites would have been nice but several were reserved; although, the web site indicated it was first come first serve. Would do in a pinch or short term. If it wasn't for the trains and no sewer we would have rated higher. We camped at Peach Beach Campark (Sunset Orchards) in a Fifth Wheel. 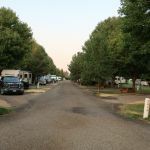 This cute little campground is a good alternative to Maryhill State Park which is right next door and always full. New amenity is WiFi - which is excellent. Luckily, you can walk into State Park and enjoy the grounds. Both parks are green and have lovely trees and grounds. Fruit stand has many flowers for sale (especially beautiful roses). Bathrooms are very old and need updating, however in an RV we can use our own facilities. Showers cost money, as in most Washington campgrounds. We camped at Peach Beach Campark (Sunset Orchards) in a Fifth Wheel. Are you affiliated with Peach Beach Campark (Sunset Orchards) ?